This little vase full of hooks is only a small representation of the hooks I own. There are times when my friend Janet and I laugh about which of us has the worst case of H.A.S. (hook acquisition syndrome for those of the uninitiated amongst my readers). I show you this bouquet to demonstrate that I love all types of hooks. 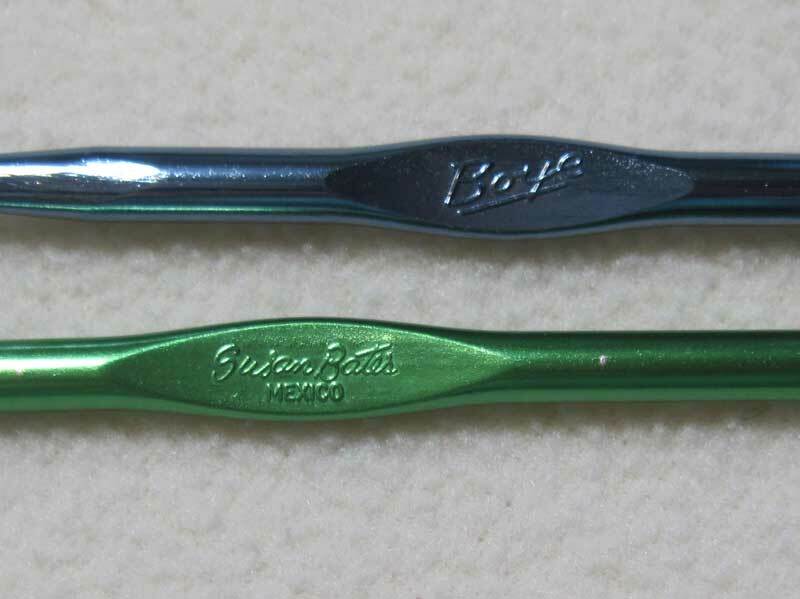 If you are an American crocheter or even if you spend much time on the Crochet boards at Ravelry (or possibly any other crochet sites), you have likely heard numerous debates of the merits of Boye versus Susan Bates hooks. Much of that discussion is about the shape of the throat. Tapered or In-line. All hooks fall into one of these categories for the most part. Boye is a very good example of Tapered shaping and Susan Bates hooks are a very good example of In-line shaping. (There are changes in the shaping of Boye and Bates hooks depending on the year and where they were made, but that is a subject for another post at a later date). Tapered hooks throats are generally shaped with a strong narrowing from the “shaft” of the hook to the head. In these images you can see a continuum of hook throat shaping. Starting on the left with the very tapered Boye hook and ending on the right with the strictly in line shape of the Susan Bates hook. The wooden hook is a Laurel Hill hook, they are a bit unusual in that the throat is mostly in-line but the overall shaping is tapered starting from the thumb rest thru the point. When I teach beginning crochet I prefer that students use an in-line style hook. Beginning students tend to have a very tight tension on their yarn and more commonly they have a harder time with that using a tapered hook. A tapered hook allows the yarn loop to become smaller as it is pulled up the throat of the hook, making stitches harder to work into in subsequent rows, these 2 things combined don’t trend toward a positive first crocheting experience. With an inline hook most beginners can keep their loops a consistent size, making it easier to work into their stitches. Though the beginner death grip can still get tight tension even with an in-line hook. If you are past the beginner stage of your crocheting though it’s time to branch out. Whatever style of hook you started with, try the opposite. Especially if you are having particular difficulty with a yarn. Oftentimes switching the style of hook or size of hook can help. As many of us know, not all yarns are right for all projects. The next thing to keep in mind is that not all hooks are right for all yarns. And the hook I find ideal for a certain yarn and project, might not be the right one for you. We all tend to use our tools with slight differences. One of the reasons that our handwriting can look quite different. Same is true of crochet hooks. An example, I adore the Tulip Etimo hooks, but some crocheting friends of mine find them not their cup of tea at all. The best way to find out which hooks will work for you is to take the time to play with some yarn and a variety of hooks. Afterall, playing with yarn is a pleasure we can all agree on, whether we think we prefer In-line or Tapered hooks. I haven’t tried in-line yet, but I sure do like my Boye hooks. 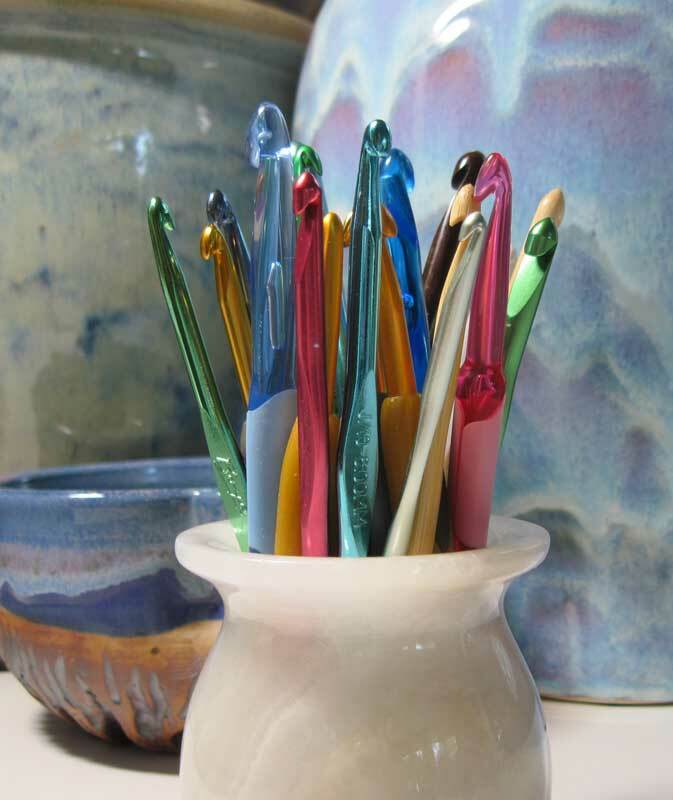 Try susan bates or tulip etimo crochet hooks, both of which are my absolute favorites, you WILL give up the Boye hooks. LOL! Now be nice Kathleen. Some folks find their Boye hooks to be the bee’s knees. Lately I’ve actually fallen under the spell of the Clover Amour hooks. They are so kind to my hands and come in a full range of sizes. I have been crocheting for over 40 years and only enjoy crocheting with inline such as Susan Bates. Crocheting with non inline is a chore and not enjoyable, and slow process. I can speed along with an inline hook. It’s wonderful that you’ve discovered what style of hook works best for you. I guess it is more related to how you hold the crochet hook. I hold it like improper spoon holding and think it is because I learned to knit first, but love crocheting more than knitting. The people that I know that crochet are half either way. Thank God there are hooks to suit all our needs and preferences. 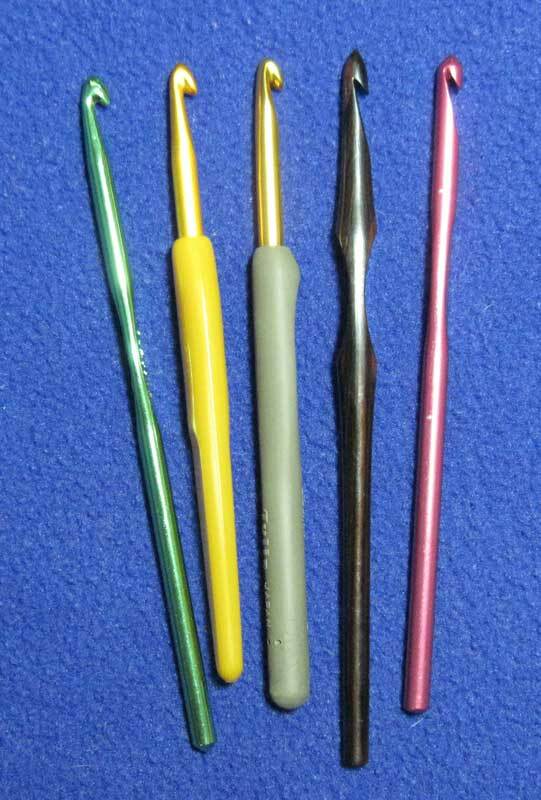 Are Clover crochet hooks inline or tapered? Thank you! 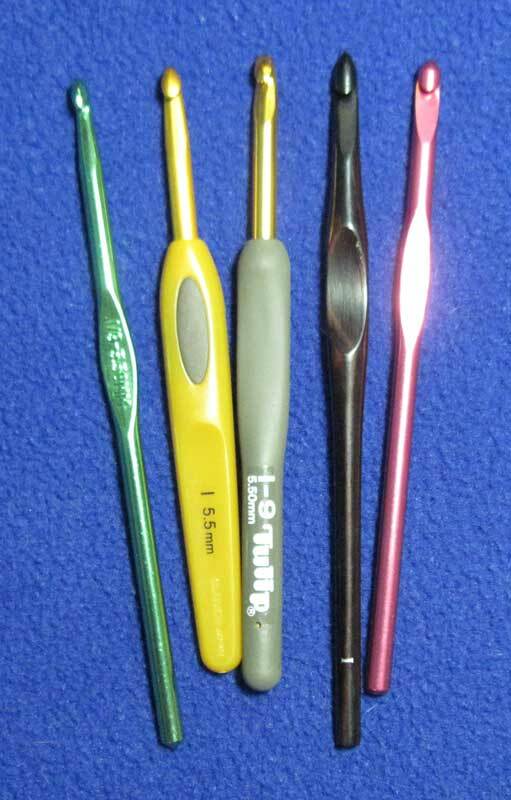 If you look at the photos of the continuum of the various hook shapes, you’ll see the Clover hook shape is the closest to the Boye tapered shape of the 5 hooks I included. The new Clover Amour hooks have the same shape to the hook end, it’s only the handle that is different from the original Clover Soft Touch hooks. Thank you so much for this explanation. I’ve been crocheting for about 6 six years now and have always used a tapered hook (boye) simply because I can find those at my local walmart if one gets lost or left somewhere. However, I have incredibly tight tension due to my yarn hold (no others feel comfortable to me) and I have to constantly stop, move the yarn up the hook and widen the loop or fight with the yarn until I manage to get the head through a tiny loop. I thought this was a normal part of crocheting! I’ll have to try an inline hook and see if those make a difference! I have been crocheting for over 50 years now and my preference has always been Boye hooks. I have tried Susan Bates and always return to Boye. They just work so much better for me. We would all be pretty dull crocheters if we all used the same kind of hooks. I guess that is why different ones are made because we are all different. Happy crocheting everyone!!!! I have always used Boye hooks even when I was learning. I crochet very loosely and even with Boye I usually end up having to use the next size down hook. Boye has always been my favorite hook. Plus I hold the hook more like a penical and wind the yarn around my little finger of my left hand instead of my pointer finger to keep my stitches from being too loose. There are so many different hands and holds (of yarn and hook) that it is one of the joys of having so many styles of hooks to choose from. There is something for everyone allowing everyone to find the hook that is “just right” for them. I have been searching for an ergonomic inline crochet hook and have some trouble. Anyone have any suggestions? I’ve never found any inline ergo hooks. The bamboo handled Susan Bates are the closest I’ve seen. Clover hooks are sort of in between “Inline” and “Tapered” and their “Amour” hooks save my hands these days. Maybe give one of those a try and see what you think? By the way Susan Bates apparently is making soft ergonomic hooks. I bought some on ebay and will let you know how they work out. Awesome! I’ll be very interested to see how those work out for you. I respect that some crocheters love Boye hooks. I have tried multiple hooks, Susan Bates, Boye, Armour, Clover soft touch, Brittany, bamboo, generic, Tulip Etimo, Hero etc. I say Tulip Etimo is a hybrid of Susan Bates and Boye, and possibly the best hook available. The cost may be problematic for some, but do what I did, buy the few you use most. I only use F, G, H and 7. And I never found a Boye 7, another reason I am not a Boye fan. Sorry if I seem opinionated, but I think a lot of us are. Nothing wrong with having a strong opinion about what works for you. In response to Susan Bates ergonomic hooks for HOME. The new soft hook handle hooks work well. The handle is smaller than Tulip Etimo but comfortable enough. They are available at Joanns or ebay. I also made handles out of gel pencil grips as found on you tube tutorial. They work very well and are cost effective which can be a concern. Hope this helps. Thanks Kathleen, it’s good to know some affordable options. Thank you so much for these very interesting and varied comments and points of advice for new and experienced crocheters. I’m in my seventh decade and have knitted and crocheted all my life. Never knew all the differences! Just did it like my mum and grandmother did. I still have an unfinished mercerised cotton tablecloth my mum started for my trousseau. Super fine hook. Doubt whether I could use it now, but never too old to learn eh. Will try some new styles. I would like to buy a couple of hand turned, wooden handled hooks which have been shown online recently. Any advice for a NZ crafter. Many thanks, Carole. Glad you’ve enjoyed my blog. I’m really not sure about where you would find hooks like that in your area. Best bet usually is to do research online. Possibly you could find a more local to you woodcrafter that makes hooks via Etsy or local craft fairs. I know from many of my Aussie friends that purchasing hooks to be shipped to them can be very costly.